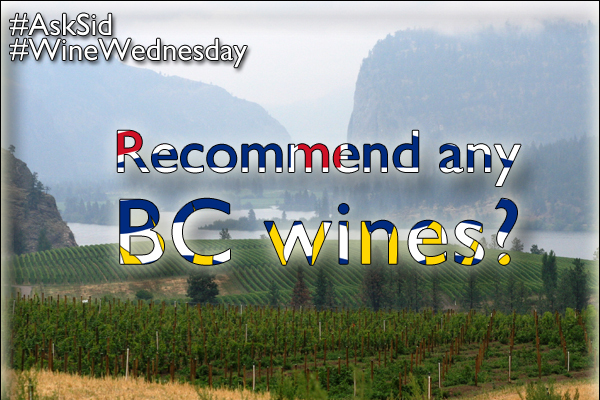 Ask Sid: Recommend any BC wines? Question: I have tried some of those sweet Ice Wines from Canada but now am hearing encouraging things from wine friends about the much improved unique dry table wines from the Okanagan Valley in British Columbia. Any helpful information or recommendations for me? These 27 year old vines in their Estate Okanagan Falls Vineyard show a complex clearly defined riesling variety with just the right balance between the lively acidity and the attractive residual sweetness. Delicious! Choice grapes from Golden Mile show juicy rich plums open aromas and palate with lovely drinking accessibilty now but no rush to drink up as will age well. Outstanding white Bordeaux blend by my old friend winemaker Luke Smith specializing in pinot noir yet here displaying so well fresh tomato plants aromas of sauvigonon blanc with lanolin weight of semillon. Stylish round apple and cinnamon notes are fresh and subtle expressing the pure expression of the chardonnay grape itself without any oak interference. David & Cynthia Enns celebrate a 10th vintage from a cooler but successful year for their red Bordeaux blend of the 5 grapes in French oak for 19 months showing deep concentrated smooth structured fruit. Pure lighter cherry fruit shows elegance from clever seasoning by the passionate winemaking team using 3 year old French oak barrels and custom made egg shaped concrete tanks. Paul & Julie’s special lot of ripe spicy peppery syrah jumps from the glass with these inviting aromas and entices the palate with soft smooth flavours of this successful Okanagan variety. A leading winery in the Okanagan celebrating 25 years by the Stewart family with some emphasis on pinot noir but they always produce truly outstanding chardonnay too. Full rich oaky expression but still fresh and inviting matching well with so many full flavoured food dishes. Prudence & Beat yet again show their skills in producing this fragrant lively subtle apricot notes wine with excellent balance all at an attractive lower alcohol level. Rather charming juicy easy fruit/oak balance using a unique blend of syrah, malbec, and petit verdot with a mix of French and American wood by talented winemaker Stephanie so well trained by Howard Soon. Have you tried wine from British Columbia?